Amino Acids are the building blocks of protein. Protein makes up the structure of all cells and tissues in the body. During activities such as weight training, micro tears are formed in the muscle. The role of protein is to heal these micro tears and make the muscle stronger as it adapts to these stimuli. Precision Engineered Amino Acids 1500mg deliver these protein building blocks in a convenient format to help support your training and fitness goals. Containing 11 non-essential amino acids which cannot be produced by the body and need to be consumed in the diet. You must be 18 years or older to purchase this product. Precision Engineered has pioneered the manufacture of premium nutritional supplements. Our commitment to quality is the highest in our industry. Every product undergoes rigorous analysis for purity, potency, safety and freshness. We guarantee it! Take two to three caplets 30 minutes before workout and then two to three caplets immediately after a workout. Do not exceed stated dose. Ensure adequate hydration during and after training. Minimum of six to eight glasses of water daily. Hydrolysed Protein, Sodium Carboxymethylcellulose, Bulking Agent (Microcrystalline Cellulose), L-Ornithine Hydrochloride, Anti-Caking Agents (Magnesium Stearate, Silicon Dioxide). No Artificial Colours, Flavours or Sweeteners. No Preservatives. No added Sugar or Salt. No Starch, No Corn, No Milk, No Lactose, No Soya, No Gluten, No Wheat, No Yeast, No Fish. Food supplements must not be used as a substitute for a varied and balanced diet and a healthy lifestyle. If you are pregnant, breastfeeding, taking any medication or under medical supervision, please consult a doctor or healthcare professional before use. Discontinue use and consult a doctor if adverse reactions occur. Not intended for use by persons under the age of 18. Phenylketonurics: Contains Phenylalanine. Keep out of reach of children. Store in a cool, dry place. Do not use if seal under cap is broken or missing. 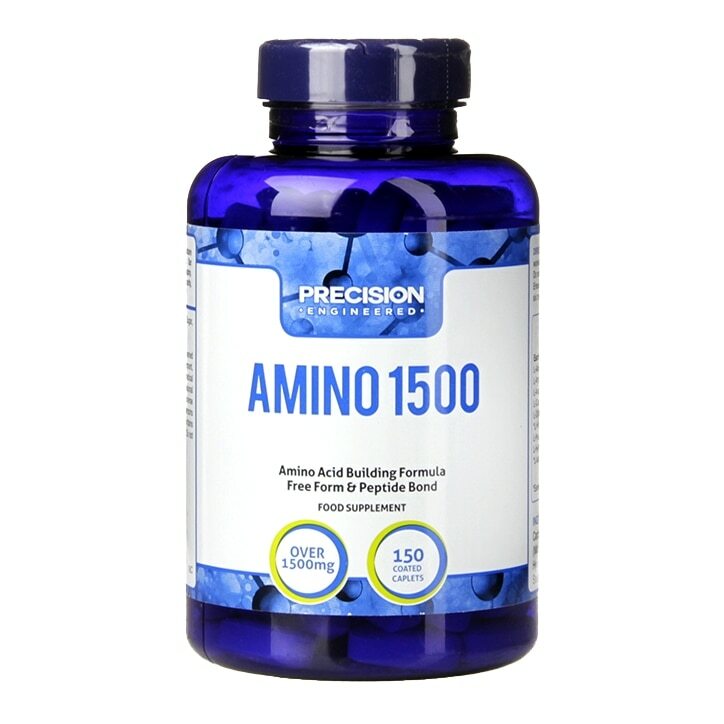 Precision Engineered Amino 1500mg Tablets is rated 4.3 out of 5 by 39. Rated 1 out of 5 by Chocmak from Far too big and caused spots I have never had any problems taking tablets af any size but not only are these huge but they also start to dissolve as soon as you take a drink making them even harder to swallow. I can’t comment on how effective they are as within a couple of days of taking them, I have broken out in painful puss filled boils and after a week of persevering I have given up taking these so a total waste of money and they were not cheap. Rated 5 out of 5 by captain S from overall impressions. I have been using these for the past 12 months..to coin a phrase they do as they say on the tin..i take them as part of my Stack. Rated 5 out of 5 by Medals from Good bcaa Second time of purchase for me. It's nice to have them for when I'm on the move or haven't got time to mix a powder shake for protein. Decent product. Take advantage of penny sale.